BANGI, 8 June 2012 – Sufism and Sufi mysticism should be taught formally as part of the syllabus in Islamic education in secondary schools, while also introduced informally in mosques and suraus. 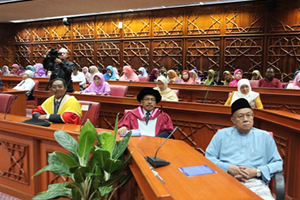 National Fatwa Council Advisor, Professor Zakaria Stapa, former Dean of the Faculty of Islamic Studies at The National University of Malaydia (UKM) said the teachings of the Sufi aesthetics will be able to encourage the people back to the path of righteousness in a society increasingly filled with vice, corruption and the breakdown of morals in the country. He suggested that the teachings should just cover general Sufism as opposed to specific Sufism, where the approach is deeper and more complex even suggesting that its teachings be made obligatory. If properly administered, Muslims will be empowered to have a more positive outcome, he said in his inaugural lecture An Approach to Sufism and Mysticism: The Crucible of Empowerment of the Ummah here this morning. He said Sufism and Mysticism have to be given more publicity in order to fend off confusion and misunderstandings about them. 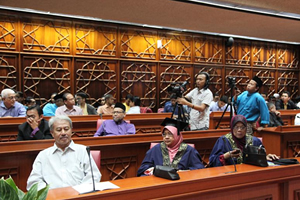 Prof Zakaria lamented that there was a lack of understanding of Sufism and the knowledge of the Aesthetics among Malaysian Muslims, causing suspicions and scepticisms. Sufism and Sufi’s order studies are not included in the Islamic Education Curriculum within the national education system and rarely taught or discussed through religious teachings or talks at mosques. The discipline is often seen to have a direct relation to deviant teachings resulting in many Malaysians being overly cautious or outrightly repugnant with Sufism. However, this lack of understanding should be curbed among Muslims themselves as it affects the Muslim’s sense of integrity and pride. Furthermore, he said, this discipline is clearly essential for the contemporary Muslim and should not be sidelined from the mainstream Islamic education. He said it is important as an approach to building self-confidence among Muslims. This can be carried out through a clear approach in dealing with moral declines and the prevalance of negative values in the Muslim community today. Therefore, a strategy to resolve this problem needs to be drawn up with key components of this discipline emphasised in ensuring accuracy of the discipline communicated to Muslims, through formal and informal education. For Muslims in Malaysia, Sufism and the teachings of the Aesthetics are not new or foreign saying that Islam may have been spread throughout the region by Sufi mystics. He said studies done over the past thirty years show that Malaysian Muslims have a very poor knowledge of Sufism and even have misconceptions about it. In other research done a few years ago, it was found that undergraduates in institutions of higher learning understand the teachings but cannot practice them because of lack of willpower. If the teaching is made obligatory, it would suffice to have students understand Sufism at the secondary school level. In the context of an institutionalised Sufism, a mentor known as the Sheikh would be the main guide and reference point. Everything that goes on in the institution would be subject to the presence of the Shiekh. 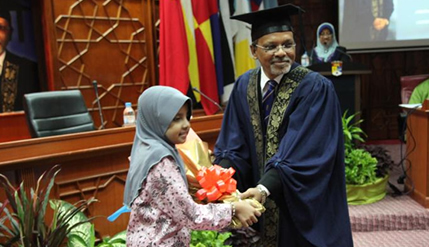 he graduated from UKM and did post-graduate studies at the University of Durham, UK.